Multi-effects processor with incredible sounds and countless combinations. Pair your amp with one of the 5 newly-created cabinet emulators to complete the sound, choosing from Marshall 1960 A-type cabinet (4x12” Celestion speakers), Fender ’65 Twin Reverb (2x12” Jensen speakers), the UK2x12 that recreates the sound of early British combo amps (2x12” Celestion speakers), Mesa Boogie Mark III cab (1x12” Celestion Black Shadow speaker), or Bogner Ecstasy cabinet (4x12 in. Celestion speakers). To explore the wealth of possibilities that the G5n offers, Zoom continuously collaborate with inspirational, professional guitarists known for their taste and love of great guitar sounds. The G5n comes stocked with 100 newly custom-designed patches that both recreate decades of essential guitar tones—like the iconic sounds of Eddie Van Halen, Jimi Hendrix, Jimmy Page, Carlos Santana, Michael Schenker, and Brian May—and pioneer new territory with combinations exclusively created for G5n guitarists. It would take an arsenal of stompboxes, amplifiers, and speakers to duplicate everything you can do with a single G5n. Use up to nine effects and amp/cabinet models simultaneously, chained together in any order you like. It's like having hundreds of fully loaded pedalboards in one compact, easy to use device. 68 built-in rhythm patterns make the G5n the perfect practice rig and enable "one-man band" performances. 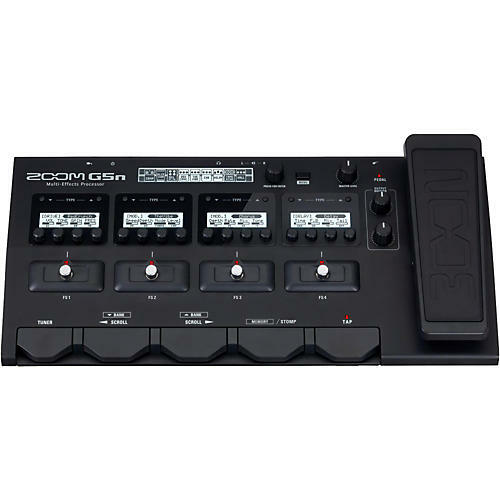 An onboard Looper (which can be used with the rhythm patterns) allows you to record and overdub phrases up to 80 seconds long through the effects of your choice. Plus there's a built-in chromatic tuner, always accessible at the touch of a footswitch—you can bypass the currently selected patch while tuning, or mute the signal altogether. Use the free ZOOM Guitar Lab Mac/Windows software to instantly download new patches, effects, and amp/cabinet simulators. It includes both a Patch Manager for effects chains and an Effects Manager, with a simple graphic user interface that provides point-and-click control over tweaking, building, and naming your custom patches. Take your recordings to a more professional level. Steinberg’s powerful and state-of-the-art audio software used by creators around the world now comes with every Zoom G3, G3X, G5, and G5n purchase. Currently shipping with: Cubase LE8 for Mac OS X 10.9/10.10 and Windows 7/8/8. Hone your tone. Own your sound. Order today.